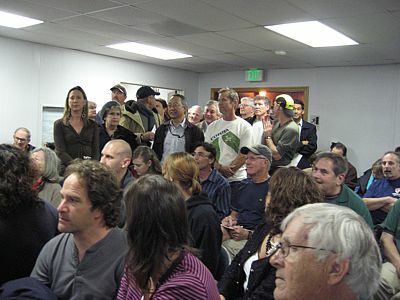 It was a standing-room only crowd at the March 2 meeting at Malibu Creek State Park on the opening of the Yearling and Lookout Trails to mountain biking. See story. Many thanks to all the concerned mountain bikers who came out to the State Parks meeting at Malibu Creek State Park to hear about the Change in Trail Use proposal for Yearling and Lookout Trails in Malibu Creek State Park. It was great to see so many new faces, as well as some old ones, all in one place. Believe it or not, it was also great to see the solid turnout by hikers and equestrians. It shows that we have a vital, passionate trail user community. During the meeting, we delivered the results of our online petition to State Parks officials. Thanks to the 550 people who signed it! The question came up a couple of times on Wednesday night as to why there is such animosity by hikers and equestrians toward off-road cyclists. We’d be just plain ignorant if we didn’t point out there are still many rude and aggressive mountain bikers who see no reason to announce their presence well in advance and slow down for other users. But then again, there are some people who simply do not agree that bicycles have a place on trails, and no matter how conciliatory the cyclists, opponents to bicycles will have a negative attitude toward cyclists. So I can understand why some cyclists might feel frustrated and have the feeling that no matter what they do, things will never change. But they are changing, slowly but surely. Last night’s turnout is evidence. I’d guess that of the 125 or so in the audience, half were cyclists, and a number of them youngsters. State Park officials take notice of this, and just the mere presence of cyclists tells them that we are passionate about being able to ride the trails, and willing to work within the process. At the risk of sounding cliché, my heart swelled with pride at the number of cyclists in the room. It renewed my faith that what we’re doing is the right thing. And that in numbers we have strength. Thank you again for validating CORBA’s mission and goals! Glendale Bike Skills Park – Show Your Support! Glendale needs a Bike Skills Park. Southern California needs a Bike Skills Park. Sign our petition and let the City of Glendale know! Bike Skills Parks are a dedicated area for bicycles and include features like a pump track, progressive tabletop jumps, balance training features, XC short tracks, and much more. They can include dirt features, man-made (cut) wooden features, natural wooden features, and rock features. They are becoming more and more popular as people realize the skill-building fun and health-promoting exercise they provide. A great example is the Woodward West Bike Park in Fresno. The City of Fresno, local mountain bike advocacy groups and the community came together to make this park a reality. We would like to see that model emulated here in Glendale. 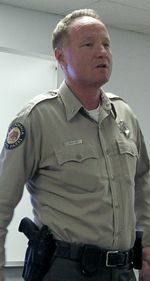 Craig Sap, Acting District Supt. On Wednesday night, the Angeles District of the California Department of Parks and Recreation (CDPR) hosted a public meeting regarding a recently submitted Change in Trail Use proposal for Lookout and Yearling Trails in Malibu Creek State Park. Approximately 125 people packed the Administration Center’s conference room, where Angeles District Acting Superintendent Craig Sap and CDPR Roads and Trails Operations Manager Karl Knapp explained the process and answered questions about it. After the discussion by Sap and Knapp, attendees were asked to gather at tables to ask questions and submit written comments to agency representatives. During this part of the meeting, CORBA hand-delivered the results of our online petition with 550 signatures to State Parks officials. CORBA's adopted trail is severely rutted after years of winter storms with no maintenance. Unfortunately, we don't have the resources to restore the trail to it's original state, but we are working to repair the drainage to keep the ruts from getting worse. We've been working our way up the trail a few hundred yards at a time, one morning a week. If you would like to help us out, please get in touch with us at trailwork@corbamtb.com. Thanks! Unfortunately we had to cancel this work day because of rainy weather in the days leading up to it. The trails would have been too muddy. 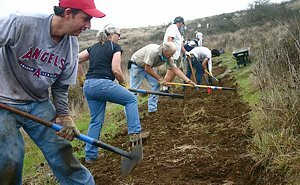 Come out and join CORBA, the Santa Monica Trails Council and other COSCA volunteers for the Annual COSCA Spring Trailwork Day. We will be working on the last uncompleted section of the Conejo Ridge Trail, in Newbury Park. Finishing this segment will enable us to ride a fun loop along trails in Newbury Park, Dos Vientos, Rancho Potrero, Rancho Sierra Vista and Deer Ridge (Los Robles Trail West). Bring your bike and riding gear and we'll ride a 9-mile loop after lunch! Following the morning of trail building, workers will be treated to barbecued hot dogs, hamburgers, vegi-burgers, snacks and drinks while enjoying the views from the top of the trail just completed. 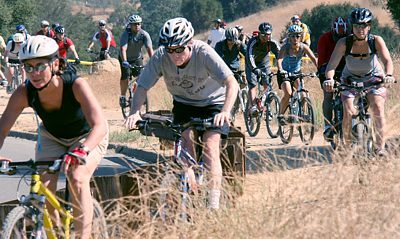 See full details and register on the Conejo Spring Trailwork registration page. We'll be working to fix up some ruts and doing other treadwork while the SMMTC will be removing invasive thistles that are overgrowing the area. See full details and register on the Latigo Backbone Trailwork registration page. This is a weekend event with CORBA, SMMTC and other trail user groups with camping at Danielson Ranch in Point Mugu State Park. You can come in Friday night and stay until Sunday or leave Saturday after trail maintenance. Some people just come in for Saturday. There will be a barbecue and raffle on Saturday evening. For more details and to register, visit our Santa Monica Mountains Trailwork registration page. On Tuesday, the Los Angeles City Council unanimously passed the Los Angeles Bike Plan. Everyone’s goal at the March 1, 2011 Council session was to do whatever necessary to get the plan passed. Councilman LaBonge needed to give his equestrian constituents, 30 or so who were in attendance, something they could live with so that the plan could move forward. The result was an amendment that simply puts in writing what will have to happen anyway before any changes to bike access to City Parks could be made. It was enough to placate the equestrian community, and did not really change anything. It was enough of a deal to get the Plan passed. Being short on time, public comments were limited to 20 minutes. Mark Langton, Steve Messer and Jim Shanman all addressed the Council supporting the plan. Members of the Bicycle Advisory Committee and LACBC also spoke in favor of the plan. In fact, everyone in the room except the equestrians loved the plan. Some of the equestrians even spoke in support of the Plan, as long as it included LaBonge’s amendment, though several of them still called for the removal of all off-road elements. Last July, CORBA board members met with LA County Planning and Sapphos Environmental (the contractor developing the Trails Manual for the County), in a Mountain Biker only public forum. At that meeting only three CORBA board members attended, the County representatives, and nobody else. Sapphos considered it more productive to hold separate meetings with each user group. The Equestrian-only meeting had many more participants, as did the Hiker-only meeting. Each group gave their input on what they’d like to see covered in the trails manual, and their special concerns. Mountain Bike Component of LA Bike Plan In Jeopardy! Come to the LA City Council meeting on Tuesday March 1st to help save it. Next CORBA Kids Club ride will be Sunday March 6. Details and registration. Next Beginners ride will be Saturday March 12th. See our Rides Calendar for details. Saturday March 5th is the next skills clinic.